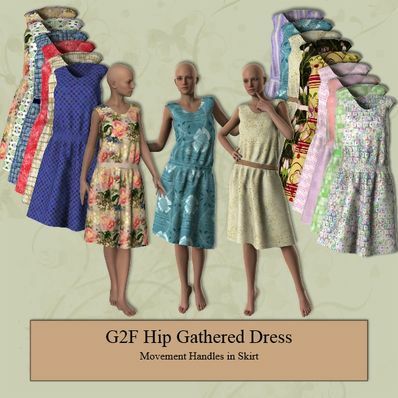 Hip Gathered Dress for Genesis 2 Female for use in Daz Studio 4.6. Thanks you so much for sharing your wonderful creations. They are a joy to use! Thanks for replying, and big thanks for sharing your beautiful work. File updated. Normals are now OK.
That's because the normals are flipped. It will still render correctly. I will get this sorted at some time. Lovely dress, but for some reason the back is black for me in Daz, can't work out why it's like that, pity as as I said, really lovely dress. I've come to your site many times (and before you had this site); I wanted to take this opportunity to say - THANKS!! A MILLION times and more. Your work (designs) are beautiful. Another good one. TYVM! Stay well! love this thank you very much. Thank you for this beautiful dress! I love this style. Good as both a sundress or a retro housedress; Thanks, Wendy. Kind of a retro look. Very nice! Thank you so much! It is exactly what I need! Wooow, it Looks beautiful. Thank you for sharing. Thanks so much for all the various textures, so many, you are most generous. Also for the movement handles. You think of everything. You're the best!